We are also hard at work building a water tower for the lumbungs. The water tower will stand about 7 meters high. 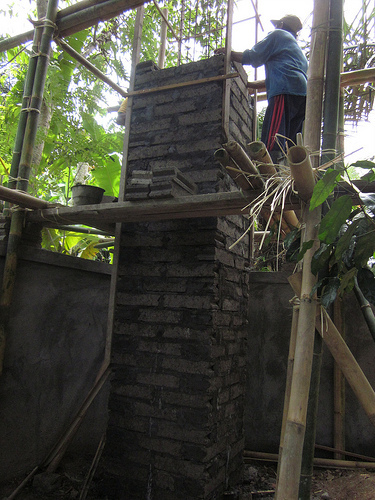 The purpose of the tower is to provide water for the bathrooms, taken from a well about 30 meters below. Water travels from the tower, down into the pipe and up into the showerhead. The tower’s height is necessary to give water pressure for showering. Inside the tower we install a floating device; if the water goes below a certain level the pump starts. The water tower ensures that in the event we lose electricity, there will be enough water for the lumbungs’ bathrooms. The tower will hold 1,000 liters, or about 400 gallons. This would provide a sufficient amount of water for two or three days. 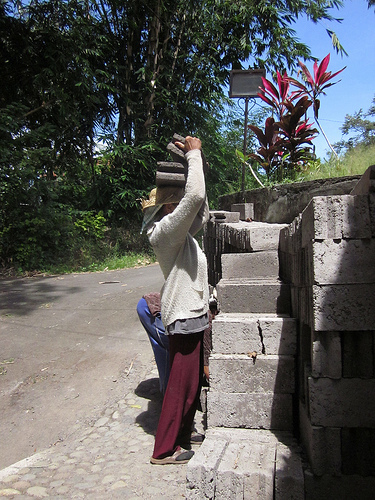 As pictured, these incredibly strong little women transfer cement bricks for the water tower from where they are stacked outside to inside the compound. One man slowly and painstakingly straightens each piece of iron for the tower. Lots of time and great care go into the marvelous quality of work done here. We are very excited about the pending completion of the lumbungs. Bamboo, known for its strength and durability, forms the frame for the water tower and is often used for scaffolding in Bali. 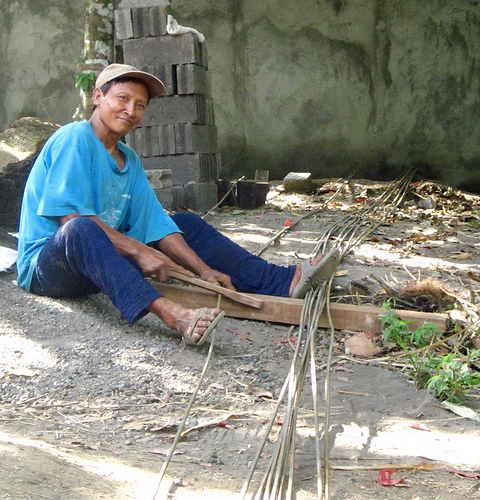 This worker diligently separates strands of bamboo. Water conservation plays an important role at Jiwa Damai. A large pond surrounds the main buildings and guest rooms. The pond is home to many different fish, microorganisms, and splendid white and purple lilies. Three different pipes drain excess water to separate ponds. Another drains water to our extensive permaculture garden. Our beautiful swimming pool is fed from a spring located underneath the pool. We employ lots of structural thinking. Every drop of water gets reused!